The project #CarbonFeed directly challenges the popular notion that virtuality is disconnected from reality. Through sonifying Twitter feeds and correlating individual tweets with a physical data visualization in public spaces, artists Jon Bellona and John Park invite viewers to hear and see the environmental cost of online behavior and its supportive physical infrastructure. CarbonFeed works by taking in realtime tweets from Twitter users around the world. Based on a customizable set of hashtags, the work listens for specific tweets. The content of these incoming tweets generates a realtime sonic composition. 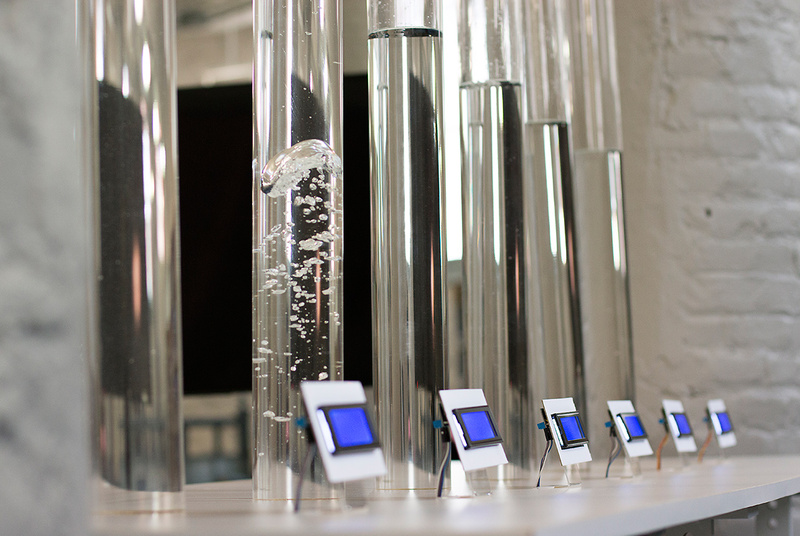 An installation-based visual counterpart of compressed air being pumped through tubes of water further provides a physical manifestation of each tweet. #Carbonfeed installed at the University of Virginia.